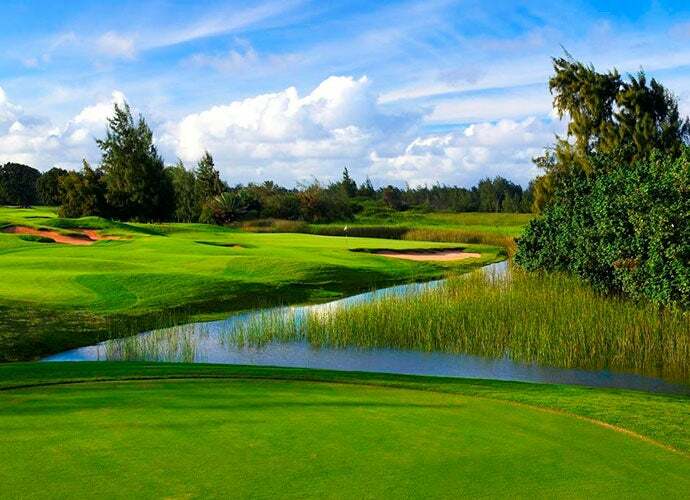 Poipu Bay Golf Course is a must-play on the island of Kauai in Hawaii. If your goal this winter is to take in amazing beaches, sugar-cane and pineapple fields, waterfalls and active volcanoes, Hawaii is totally worth the journey. Toss in 80-degree days, impeccably groomed golf courses—and perhaps plenty of cashed-in frequent flier miles—and Hawaii becomes closer still. Here’s what you need to know for your perfect Aloha State golf getaway. Must-Plays: Robert Trent Jones Sr. lists Mauna Kea among his five favorite designs (of more than 400) and it’s easy to see why. A recent renovation by Trent’s son Rees has restored the teeth, via deep, sprawling traps and dramatic forced carries, notably at the 272-yard, par-3 third hole, which demands a carry over the Pacific Ocean. Home to the PGA Champions Tour’s Mitsubishi event, the Four Seasons Resort Hualalai course is player-friendly—especially on the minimally contoured greens—where highlights include the jaw-dropping par-3 17th, its putting surface jabbed into black lava rock and backdropped by the Pacific. Don’t miss: Flawless service, guest rooms with outdoor lava-rock garden showers and Jack Nicklaus’ friendliest design elevates the Four Seasons Resort Hualalai. Off property, dine at Merriman’s in rural Waimea, which was the pioneer in farm-to-table Hawaiian Regional cuisine. The Kalua Pig and Sweet Onion Quesadilla starter is sublime. Must-play: Wind-whipped, boldly bunkered Poipu Bay dishes out an exclamation point-filled back nine, notably at the cliff-top, oceanside trio of holes 15, 16 and 17. Tiger Woods won the PGA’s Grand Slam of Golf here seven times in its 13-year run, while Phil Mickelson once shot 59 in winning the 2004 event. 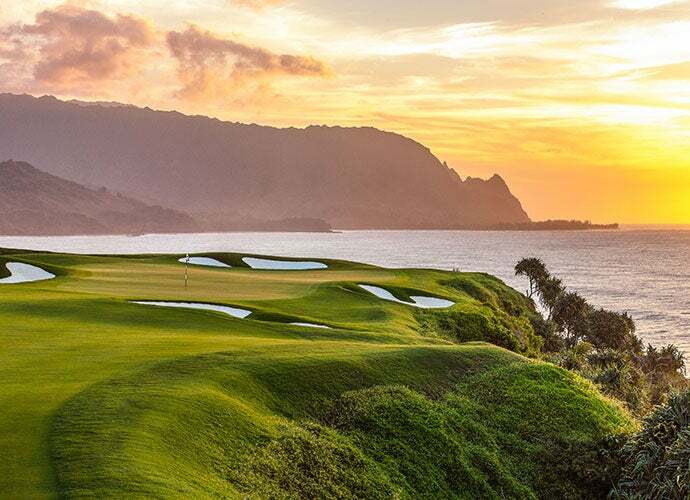 One of Robert Trent Jones Jr.’s earliest and most spectacular creations, Makai at Princeville sports risk/reward options, lush landscaping and Pacific encounters. Hokuala’s Ocean course features four consecutive oceanside holes and a Jack Nicklaus design. Don’t miss: The St. Regis Princeville fuses ocean and mountain settings on the Garden Isle’s tropical North Shore. It boasts an infinity pool that melts into the sand and Hanalei Bay. Off campus, Tahiti Nui has been dishing out tasty regional fare, local music and crazy-strong Mai Tais since 1963. Kicking back at ‘da Nui’ is a Hanalei tradition. Must-play: Jack Nicklaus’ 24-year-old Manele layout in the shadow of the Four Seasons Resort is best known for its incomparable 202-yard, par-3 12th, its green and tee separated by vertical cliff faces and the crashing surf of Hulopo’e Bay 150 feet below. Other holes twist among black lava outcroppings above the Pacific Ocean. Don’t miss: Overlooking a marine sanctuary that’s home to spinner dolphins and humpback whales, the Four Seasons Resort Lanai serves up superb snorkeling, tranquil gardens and koi ponds and nearly 100,000 feet of shoreline. Legendary chef and restaurateur Nobu Matsuhisa serves up the freshest Japanese-Hawaii fusion creations imaginable, from sushi to tempura to Wagyu beef at Nobu Lanai. Must-play: Best pals Justin Thomas and Jordan Spieth have captured the past two Tournament of Champions events at Kapalua’s Plantation, a 25-year-old Bill Coore/Ben Crenshaw collaboration draped atop a former pineapple plantation that features extra-wide fairways, jungle-strewn canyons and stellar views of the Pacific Ocean. Crisscrossed with lava chutes and punctuated with ocean vistas, Wailea’s Gold is a rock-solid Robert Trent Jones Jr. design. Its scenic sibling, Wailea Emerald, sports more dramatic elevation changes and fewer forced carries than the Gold. Don’t miss: Fresh off a $70 million dollar renovation in 2015, the beachside Fairmont Kea Lani, Maui offers the acclaimed Willow Stream Spa, Wailea Golf and the superb Ko restaurant. Worth the drive is Mama’s Fish House on the North Shore, which has wowed diners since 1973 with fresh catch specialties, diet-busting desserts and umbrella drinks at sunset. 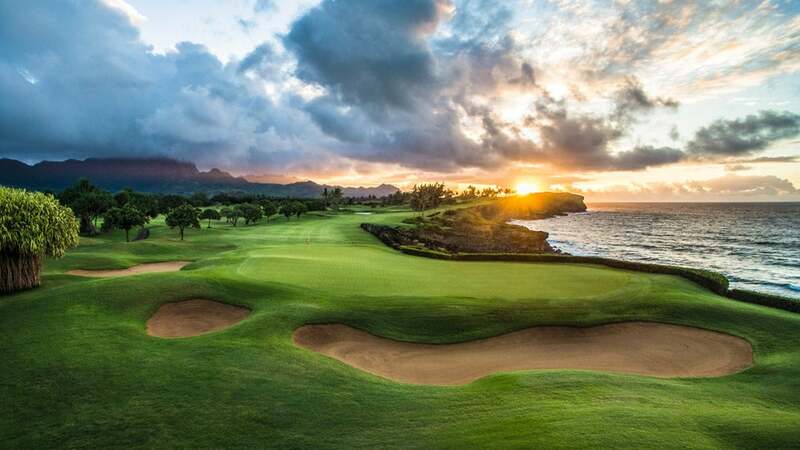 Must-play: Turtle Bay’s Arnold Palmer course is a frequent LPGA and Champions Tour host that boasts a superior location along Oahu’s fabled North Shore. While experts call this a surfer’s paradise, fans of this coastal creation state that it’s a golfer’s Garden of Eden as well, provided you can navigate a layout studded with bunkers, wetlands and water hazards, notably at the 452-yard, par-4 17th, its green practically set into the beach. Don’t miss: Turtle Bay Resort’s beaches are world-famous for surfers and sunbathers, but so are its lush forest sanctuaries—accessed on foot or horseback—which starred many times in the TV show “Lost.” Roy’s now offers 26 locations nationwide; go feast on the Misoyaki Butterfish and Maunalua Bay views at the original Roy’s in Hawaii Kai, 25 minutes east of Honolulu.